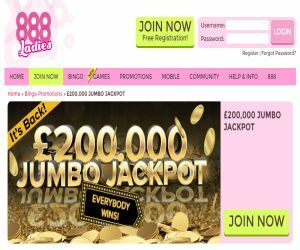 £200K Jumbo Jackpot is back | Grab your share! Lord Bingo News Bingo Promotions £200K Jumbo Jackpot is back! £200K Jumbo Jackpot is back! Hot of the heels of the hugely successful Jumbo Jackpot in 2015, the Jumbo Jackpot is back! And it's ready to rock the reels for 2016! The Jumbo Jackpot first launched last year in May 2015, and was so popular that it returned again in September 2015! The game is one of the biggest linked network of 90 ball jackpot games, and runs straight across the 888 / Cassava software network. The jackpot is so red hot popular as ‘everybody wins', and runs across the some of the biggest brands on the market like 888 Ladies, Foxy, Cheeky, Wink, Red Bus Bingo, Iceland Bingo and more! In September the linked 90 Ball game awarded lucky winners at Foxy Bingo (£50K), Cheeky Bingo (£30K) and Iceland Bingo (£20K). The rest of the £100,000 was shared between all the other lucky players. The word on the street is that the next £200K Jumbo Jackpot will be hosted on 27th February from 8pm, and then again on 30th April from 8pm! You can get in on the action if you check each participating brand and then head to the Jackpot lobby. The red-hot prize pot is usually split between the full house winner (£50,000), one line winner (£20,000) and two line winner (£30,000). As with the previous games, the rest of the mammoth £100,000 prize will be shared between all other players. Each ticket can be bought for as little as £1 each, and the more tickets you buy, the more chances you'll have to grab your share!